Our Scholarships for Disadvantaged Maasai Girls project (2014 – present) is an ongoing initiative in partnership with the Pastoral Women’s Council (PWC) which aims to facilitate and encourage girls to access secondary education through the provision of four-year scholarships (academic or vocational) at Emanyata Secondary School, Ololosokwan, northern Tanzania. The school is a community owned boarding school, and currently enrols 203 girls and 173 boys. Students are in school six days a week and have a comprehensive extra-curricular programme with a focus on agriculture and livestock-keeping as well as study clubs and sports clubs. PWC targets girls who perform well academically but who are at risk of early forced marriage, female genital mutilation and unplanned pregnancy. The interview test for a scholarship involves a written test in Kiswahili, English, Mathematics and an oral interview. This project is funded by Trusts and Foundations, as well as a small group of regular donors. Annually, PWC receives over 350 applications for scholarship placements, and the number of applicants who can be offered a scholarship depends on available funding. It costs £600 per year to fund one girl through Emanyata, this is inclusive of boarding costs and essential items such as a uniform, sanitary products and soap. For more information, please contact Helen Strefford our Trusts and Grants Officer by email helen@african-initiatives.org.uk or phone 0117 915 0001. Tanzania has the world’s lowest student transition rate from primary to secondary school; according to the United Nations, Tanzania’s education system is ranked 143 out of 181 countries and has a gender inequality index of 119 out of 146 countries. In northern Tanzania’s marginalised communities, girls face complex barriers to education, such as poverty, gender inequality and cultural norms. In Pastoralist (semi-nomadic farming) groups such as the Maasai, families often value cows more than their daughters, seeing no value in ‘investing’ in their education. Early marriage is planned for girls as young as twelve-years-old to secure a dowry. An education for a Maasai girl is an education for life. Educated Maasai women return to their communities with knowledge and skills which benefit the whole community. The Maasai want Maasai nurses and doctors who can treat their sick. Maasai lawyers who can fight for their land rights and Maasai teachers who can teach students. PWC have created a sustainable process of retaining positive cultural traditions and negating others like early and forced marriage. Educated girls perpetuate positive aspirations for other young Maasai girls for generations to come, creating long lasting and positive attitude change within their communities. 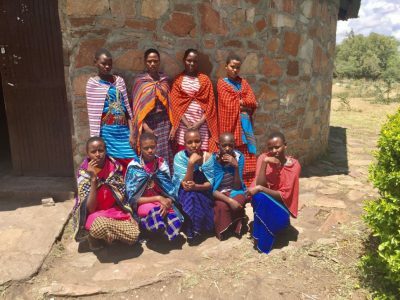 have been secured for Maasai girls since African Initiatives partnership with the Pastoral Women’s Council began in 1997.
was raised for girls’ scholarships in 2017/18 which provided enough funds to support 6 girls through school for 1 year.